If evidence of the Higgs boson revealed two years ago was the smoking gun, particle physicists at Rice University and their colleagues have now found a few of the bullets. The European Organization for Nuclear Research (CERN) published research in Nature Physics this week that details evidence of the direct decay of the Higgs boson to fermions, among the particles anticipated by the Standard Model of physics. A graphic shows particle traces extending from a proton-proton collision at the Large Hadron Collider in 2012. The event shows characteristics expected from the decay of the Standard Model Higgs boson to a pair of photons. Further analysis of collisions in 2011 and 2012 has found evidence that the Higgs also decays into fermion particles, according to a new paper in Nature Physics to which Rice University scientists contributed. The finding fits what researchers expected to see amid the massive amount of data provided by the Large Hadron Collider (LHC). The world’s largest collider smashed protons together in hope that the encounter would produce the short-lived Higgs boson, leaving signs of its decay in the traces recorded by experiments designed and built at Rice and elsewhere. Authors of the paper by the Compact Muon Solenoid (CMS) collaboration include Rice researchers Paul Padley, a professor of physics and astronomy, and Karl Ecklund, an assistant professor of physics and astronomy. 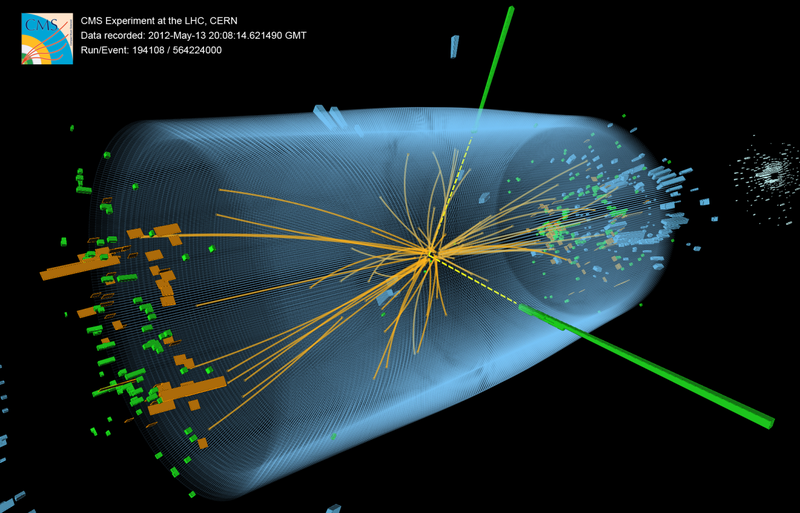 The decadeslong search for the Higgs, which physicists believe gives mass to the fundamental particles, has been a primary focus of the $6 billion LHC. The CMS is one of two main experiments at the collider. The other, ATLAS, has also found strong evidence of fermions from decaying Higgs bosons, though that team has yet to publish its results. Fermions are even more elemental particles that include quarks and leptons (which include another subparticle, electrons). They exist for only a minute fraction of a second after emerging from the decaying boson, but because they’re moving away from the collision at tremendous speed, they can be tracked. The Rice researchers are building and testing CMS components for the upgraded LHC, which they expect CERN will boot up next spring for the second run of experiments starting in the summer of 2015. “It’s going to be focused on new things that could appear at higher energies,” Ecklund said. “One definite target will be seeing more Higgs bosons, which should tell us a lot more about their properties. “The discovery of the Higgs boson was a beginning, not the end,” Padley said. “The first step is to measure with great precision the properties of the Higgs boson we’ve discovered, and then use it as a tool for further discovery.